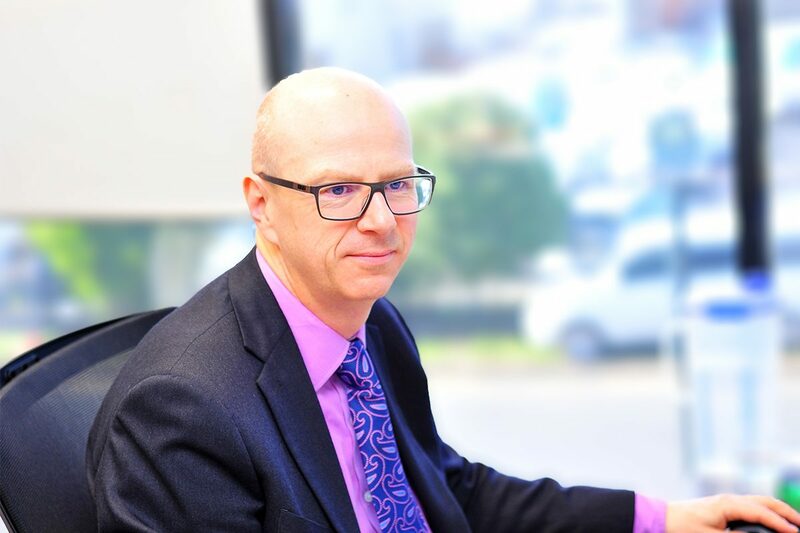 HERA is currently working on assessing the fire performance of a typical New Zealand light steel frame floor of a multi-storey building with the aim to provide input into the fire section of the resulting design guide. As the first part of the research, an overseas experimentally-tested floor slab has been investigated numerically by advanced sequentially-coupled thermal stress analysis (FEA). In 2008, the Steel Construction Institute (SCI) conducted a loaded fire test on a 4.1m span light steel frame floor at the Building Research Establishment (BRE) in the UK (which is their equivalent to BRANZ). Supporting a loading of 2.5kPa, the test specimen achieved an FRR of 90 minutes. In order to satisfy the acoustic requirements for a separating floor in a multi-storey residential building, the ceiling was formed from 3 layers of 12.5mm fire resistant plasterboard. However, the 200mm deep C-sections were formed from 1.6mm thick European grade S280GD galvanized steel (yield strength 280 MPa); this type of steel is very different from that used in Australasia, which is normally G500 or G550 (yield strength 500 or 550 MPa). Given that it has been shown that high strength Australasian produced steels lose their strength more rapidly at elevated temperatures than European steels, it was necessary to reconsider the performance of NZ made light steel framed floors in fire. HERA has successfully matched the steel joists experimentally recoded temperatures from the BRE fire test. Following, the floor centre sagging in fire was predicted and the influence of steel grade was assessed. The results show that for identical steel joist thickness the influence of steel grade is negligible, as shown in the picture. 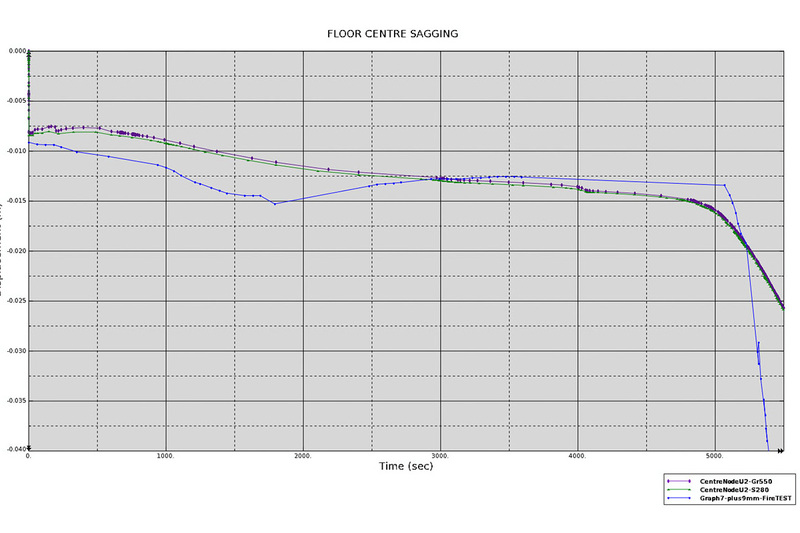 Figure 1: Floor centre sagging versus time. Experimentally recorded (fire test) and FEA predicted sagging for grade S280GD, grad 550 steel. Figure 2: Structural model showing the screws modelled. 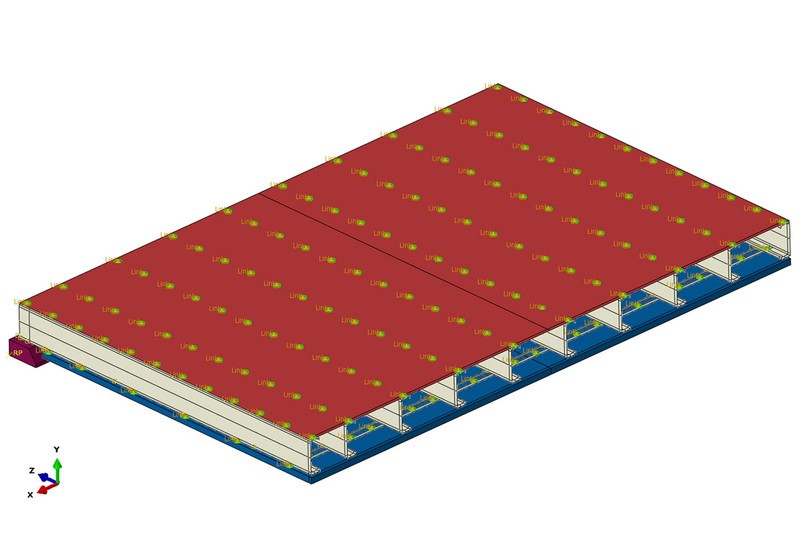 To validate the finite element analyses predictions, a loaded fire test on a composite slab using the Hibond 80 deck was undertaken in October 2016 at the world-renowned fire test lab Exova Warringtonfire in the UK. Apart from its prestige, the reason for selecting Exova Warringtonfire was that the larger furnace size provided compared to local laboratories meant that the heated span was equal to the maximum that would occur in practice.